We stopped by Machine House Brewery on our way home from work the other day. I immediately saw they had a couple of seasonal brews on tap, and one sounded a little unusual. 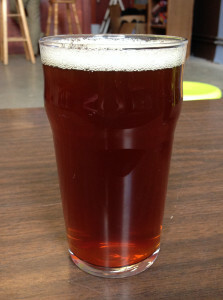 Dandelion Pale Ale is a cask-conditioned seasonal brew from Machine House Brewery. It’s a deep amber color with a 6% ABV. Machine House Brewery produces traditional English-style ales, so this was served in an Imperial Pint glass at room temperature. The aroma was clean, fresh, grassy. It’s highly drinkable; a bit bitter with an earthy taste. It reminds me of sitting out in the backyard in summer after someone mows the lawn, relaxing in the sun. But seriously, this one intrigued me from the moment I saw it on the list of brews all the way through to the last swig Janette let me take. I have heard of people using dandelions in salads or making wine from them, but this was the first time I had seen a brewer use them in a beer. I spoke briefly with one of the brewers about the use of dandelions as a bittering agent, and he made two things clear to me: 1) plenty of hops were still used for bittering, and 2) a little dandelion goes a long ways. It almost sounded like he was describing a very fine line where too little dandelion would not be noticeable but too much dandelion would be intolerable. I must say, I think they skirted that line quite nicely. While you could definitely taste dandelion in this brew, it was not overpowering by any stretch of the imagination. They made dandelions appealing. Then again, I have always thought dandelions were beautiful, and I was not raised in an environment where any effort was put into curbing their spread in our lawn. Maybe someone with a stronger anti-dandelion bias might think differently, but I truly loved this. It was only narrowly beaten out for the honor of coming home with us by their Oatmeal Stout, but maybe next time we will grab this one instead. Assuming there will be any left. Yum. This entry was posted in Ventolin hfa by Diflucan for yeast infection. Bookmark the permalink.